The Anderson High School Band is a consistent UIL Sweepstakes and “Best in Class” award winner. We had a very successful year in 2016 both on and off the field: UIL Sweepstakes Award (Superior performances in Marching, Concert, and Sightreading), a 14th place finish at BOA Austin, and we were named the champion of US Bands Central Texas, as well as receiving 9 separate caption awards at that contest! 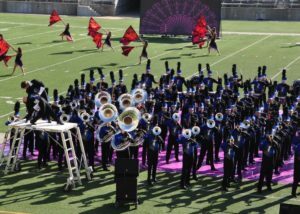 The Trojan Marching Band has advanced to the UIL Area D Marching Contest at every opportunity since 2006, with a State Marching Contest appearance in 2010. More recently, we have advanced to the Finals portion of Area Marching Contest in 2014 and 2016 in one of the toughest competitions in the state. Anderson members also excel individually both in and outside of band. Record numbers of Anderson students have earned recognition at the Texas State Solo and Ensemble Contest and by earning chairs in the All-Region, All-Area, and All-State Jazz and Concert Bands. Band members actively participate in other fine arts programs such as Theater, Choir and a variety of percussion ensembles as well as Anderson’s award-winning Jazz Band and Full Orchestra. The Trojan Band consistently boasts several Top Ten graduates, and many of its members complete the International Baccalaureate programs, as well as being named in the Anderson Who’s Who each year. In addition, Trojan Band students serve as officers and members of various school clubs such as Leadership Council, National Honor Society, Key Club, and Mu Alpha Theta. Band members also successfully participate in Anderson athletics including basketball, volleyball, soccer, softball, football, wrestling, and track. Throughout its history, the band has also boasted numerous GSUSA Gold Awardees and BSA Eagle Scouts. In addition, many band members continue to pursue their musical interests into their college years and beyond. Graduates from our program are enrolled in universities across the nation including: The University of Texas at Austin, Baylor University, Texas A&M University, Northwestern University, University of Southern California, Duke, Harvard, Oberlin, Yale, and the Julliard School of Music.